Spring in Paris means, among other things, Roland Garros (that's what the French call the Grand Slam tennis tournament we know as the French Open), and Roland Garros in 2010 meant you could be wearing a hat and sunglasses one minute and opening your umbrella the next. 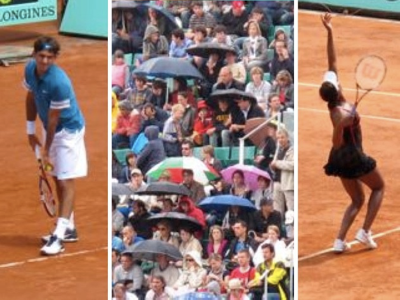 On this day the rain briefly interrupted matches involving Venus Williams and Roger Federer, but the fans took it in stride. Spending a day watching the world's best players on the clay in the Bois de Boulogne can enrich your vocabulary: a 40-40 score is not deuce but "égalité," break point is "balle de break," a tiebreak is "jeu décisif" and men's singles is "simple messieurs." And the clay, which the French call "terre battue," isn't actually clay, it's crushed red brick. Tickets to this extremely popular tournament are hard to come by (they go on sale online in February, and sell out in a few hours), but it's well worth the effort.